INGOLSTADT : November 28, 2008 – In future, the AUDI AG motorsport programme will be based on three pillars: During the 2009 season, the brand with the four rings will compete once again in the 24 Hours of Le Mans and in the DTM. Additionally, with the new Audi R8 LMS, Audi Sport offers for the first time a racing sports car specifically developed for customer use. Audi aims to demonstrate "Vorsprung durch Technik” specifically in the 24 Hours of Le Mans. Audi is just one victory behind Ferrari in the French endurance classic’s all time winners’ list following its eighth victory last June. Only Porsche has more wins at Le Mans. Audi targets the ninth victory in probably the world's toughest car race, in which the development of alternative and fuel-saving power concepts are the focus of attention, in June 2009 with a newly developed LMP1 sports car. The Audi R15 TDI differs significantly from its predecessor, the R10 TDI, at first glance and features many technically innovative details with which Audi aims to maintain its supremacy in Le Mans. Audi competes in the DTM as defending champions with a development of the 2008 championship winning car and with an ambitious target: Audi aims to be the first automobile manufacturer in the history of the "new” DTM to win the title three times in succession. 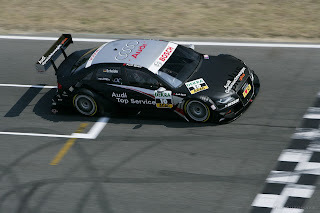 The DTM version of the new A4, which set the standards during the 2008 season with eight pole positions and six victories, is optimised in every area and carries the project name "R14 plus” internally. The new Audi R8 LMS will be seen in action on the race track during the 2009 season: Up to eight customer cars will compete in different European race series and in the 24-hour race at the N?rburgring, for which Audi Sport develops an endurance version of the R8 LMS. The factory itself does not plan to enter any races with the new GT3 car. WOLFSBURG : November 28, 2008 - When the Dakar Rally starts in Buenos Aires on 3 January 2009 with four Volkswagen Race Touareg vehicles it will also give the starting signal for a wide-ranging Volkswagen motorsport programme next year. In 2009 the brand will extend its activities in Formula 3 and start competing in Great Britain as well. In addition, a Scirocco Cup will be launched in China. Two weeks after its unveiling in China the new competition vehicle – alongside the Race Touareg 2 for the "Dakar”, the Scirocco GT24 that was victorious in the 24 Hours at the N?rburgring and the Formula 3 racing car "powered by Volkswagen” – will be showcased on the Volkswagen stand at the traditional Essen Motor Show (29 November to 07 December). Besides cross-country rally racing, Formula 3 and the Scirocco Cup in China, Volkswagen Motorsport again plans to enter the Scirocco GT24 in the 24-Hour Race at the N?rburgring. In addition, the commitment encompasses the promotion of young talent in Germany with the ADAC Volkswagen Polo Cup and the ADAC Formula Masters powered by Volkswagen, the fielding of the Baja Race Touareg TDI in the USA as well as further one-make cups in various countries. In the season that just ended Volkswagen Motorsport delivered a convincing performance with numerous different exploits. The highlights: with the Race Touareg the brand achieved two second places with three starts, five further podium positions and 18 of 22 possible stage victories. At the Scirocco's racing debut, which preceded the sport coupe's market launch, Volkswagen celebrated a one-two class victory in the 24-Hour Race at the N?rburgring. In the first full Formula 3 season Edoardo Mortara (I) and the Signature team immediately clinched the "vice champion's” title in the drivers and teams standings in the Formula 3 Euro Series; three victories and 13 podium positions went to the two-litre engine from the Volkswagen Group. At the world finale in Macau (CH) in November Mortara was victorious in the sprint race and finished the main race as the runner-up. The Formula 3 tally is complemented by two wins and a total of nine podium positions achieved by Laurens Vanthoor (B/Van Amersfoort Racing) in the German ATS Formula 3 Cup. Complementing its cross-country rally activities, Volkswagen contests select events in the SCORE off-road series. Following the successful debut of the Baja Race Touareg TDI – a vehicle that fundamentally differs from the Race Touareg for the "Dakar” and is fitted with a 550-hp TDI engine from the Volkswagen Group featuring a Clean Diesel concept - in November 2008, the 2009 programme includes the brand's participation with two vehicles in the world famous Baja 500 and Baja 1000 off-road events. The high level of confidence which Formula 3 teams have in Volkswagen technology – not least due to the quick exploits achieved – is documented by the great interest they show in contesting the 2009 season "powered by Volkswagen”. In 2009 Volkswagen Motorsport's commitment will involve three series: the Formula 3 Euro Series, the ATS Formula 3 Cup in Germany as well as – for the first time – the British Formula 3 Championship. In the United Kingdom, a total of six vehicles will start from the grid with Volkswagen engines, two of them to be fielded by the T-Sport team. In the Euro Series the Signature partner team will enter three vehicles powered by the 210-hp Volkswagen engine, the newly formed Kolles & Heinz Union team will run two vehicles in the races and a third team will field two vehicles as well. In the German Formula 3 Cup the Performance Power team will join Van Amersfoort Racing as an additional member of the Volkswagen family. Another successful junior programme will start to its second round in 2009: the ADAC Formula Masters "powered by Volkswagen”. The inaugural season of the series featuring identical cars to which Volkwagen supplies a 1.6-l four-cylinder FSI engine that immediately delivered convincing reliability was won by the Portuguese Armando Parente. The "touring car school” success formula will enter its twelfth season in 2009. The ADAC Volkswagen Polo Cup will again be staged as the DTM's partner series in nine races at seven events. 27 drivers from seven nations who have successfully completed the evaluation programme of the one-make cup for rookies will start from the grid in 150-hp Racing Polo cars that are centrally fielded. In 2008 the cup concept proved to be a resounding export success. The Jetta TDI Cup was the first American one-make cup to establish Clean Diesel technology in motorsport and in a sporting sense, as well, the new cup turned into a guaranteed success, as confirmed by over 1,700 applications for the 2009 season. 2009 will see a further expansion of the talent promotion programme that is marked by utmost equality of opportunity. In China, centrally entered Scirocco cars developed by Volkswagen Motorsport in Germany will be used in a one-make cup for the first time. The 200-hp touring car fitted with a 2.0-litre TSI engine was unveiled at the Guangzhou International Motor Show following initial tests at Oschersleben. 30 vehicles are being built as a mini-series for contesting six races in China. The Volkswagen Scirocco GT24 made a successful debut in 2008. The 330-hp touring car celebrated its premiere at the legendary 24-Hour Race on the Nürburgring-Nordschleife even before the official presentation of its road-going counterpart. And it was a successful maiden race at that. In the ultra-competitive SP3T class for 2-litre touring cars the Scirocco GT24 immediately clinched a one-two victory. The three factory-entered and factory-prepared vehicles saw the chequered flag at this circuit endurance race in first, second and fifth place in class. In the overall classification the best Scirocco with drivers Jimmy Johannson (S), Florian Gruber (D), Thomas Mutsch (D) and Hans-Joachim Stuck (D) finished the classic in a strong eleventh place – surrounded by more powerful GT sports cars. In 2009 the GT24 will return to the venue of its first ever exploit. Volkswagen will again contest the race with the car that became a favourite with the audience. The IFR Aspid supercar from Cataluña made a special pit lane appearance in front of 34,000 motorsport fans at the final race of this year’s inaugural Superleague Formula championship held in Jerez. The Spanish-built sports car was driven by the series founder Alex Andreu and a number of Superleague race drivers. It is being considered as a possible safety car for the 2009 season. Celebrities invited to test the car included Spanish driver Adrián Vallés, who races for the Liverpool FC Superleague team, as well as the Formula’s race commentator and fellow Spaniard, Luís Moya, the now-retired and highly experienced rally co-driver who scored 24 world rally victories throughout his career and whose name is synonymous with Carlos Sainz. Following the race weekend, Fernández then spent his longest time yet in the car when he drove it for 11 hours, including breaks, for the return journey from Jerez to Reus near Barcelona in northern Spain, where the company is based. The 1,100km (almost 700 miles) trip took in a wide variety of road conditions ranging from fast motorways and cross country routes to traffic jams in Valencia. Tipping the scales at 750kg, yet full of luxury touches and advanced technology, the Aspid represents a new breed of small, lightweight, fuel-efficient sports car that is faster than a track-day special without compromising creature comforts such as having a roof over your head and luxuries including climate control fitted as standard. With technical innovations and ingenuity displayed throughout the chassis, suspension, brakes and electronic systems, the Aspid offers exceptional dynamic performance particularly relating to road holding, handling and safety. Despite its high performance capability on the track the car is exceptionally easy to drive on the road.